Some nanotechnologies use nanomotors, tiny machines capable of assembling ultra-stable RNA structures with a wide range of scientific and biomedical uses. Here a nanomotor was used to assemble a DNA aptamer-based targeting molecule that binds to a receptor which is overexpressed on ovarian cancer cells, Annexin-A2. 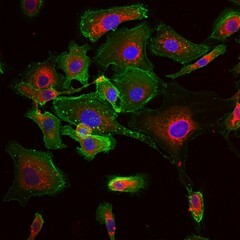 This image shows the entry of RNA nanoparticles (red) into ovarian cancer cells (blue and green). The goal of this drug delivery system is to target ovarian cancer without damaging healthy tissues.